There are a lot of good costumes in Marvel’s Spider-Man. Like, a lot. They kept adding them, too! And while my dear colleague Germain made a pretty solid case for why the game’s mindbogglingly clever “vintage comics-style” suit is one of its best, the game’s last slice of DLC added what has become my Spidey-Spandex of choice. “Silver Lining,” the third and final part of Spider-Man’s “City That Never Sleeps” downloadable storyline, was released just before Christmas. Overall, while it doesn’t match up to the highs of the main game’s story, it felt like a much more solid tale than its two, uneven predecessors, mainly down to the fact it actually got to wrap up the overarching plot around mobster villain Hammerhead (and build on story threads left annoyingly dangling in other parts of the DLC). 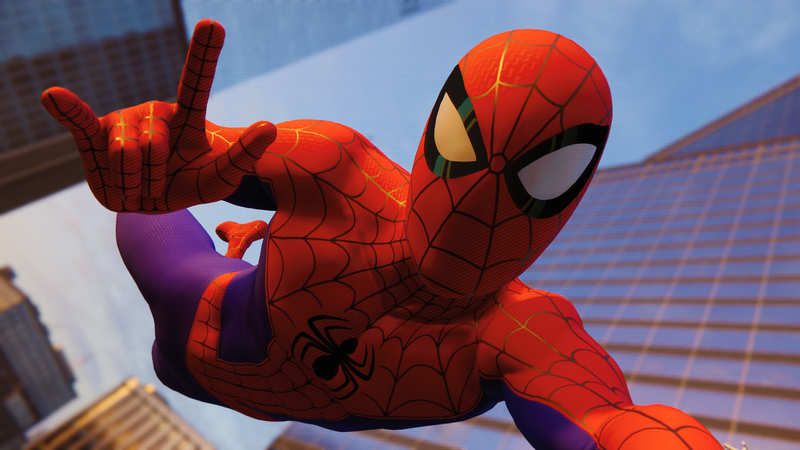 But my favourite thing about it was that, in a brilliant bit of cross-media marketing with the release of (the incredible) Spider-Man: Into the Spider-Verse in December, the final suit you could earn for getting a 100 percent completion rating for the DLC was Peter’s suit as seen in the movie. Against the “real” background of New York, this suit looks so wrong, yet so good. But it wasn’t just the body of the 23-year-old Peter Parker of Marvel’s Spider-Man with the Spider-Verse candy-coloured costume layered over him. That would’ve been good enough, honestly. There are enough tiny little details lifted from the film’s style in the suit, from its own hatched, subtle shading style, to its use of Ben-Day dots, to the fact a tiny little bit of chromatic aberration can be seen in the black of the suit’s lenses. 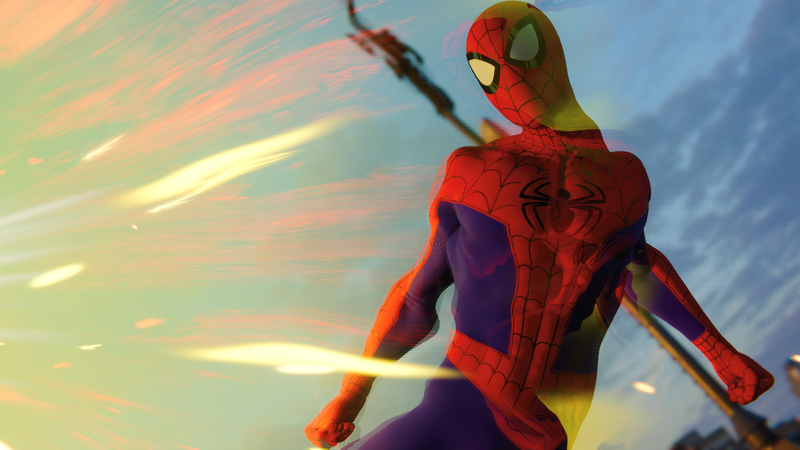 But Insomniac also brought Peter’s entire, wiry body as it appears in the film’s gorgeously stylised aesthetic into the hyper-realistic world of the game. His torso juts out into a superheroic V-shape that even Chris Evans at his most Dorito-esque would be envious of, if he could ever replicate the cartoonish exaggeration. His limbs are all unnaturally long and spindly, like he’s more legs than he is actual (Spider-)man. 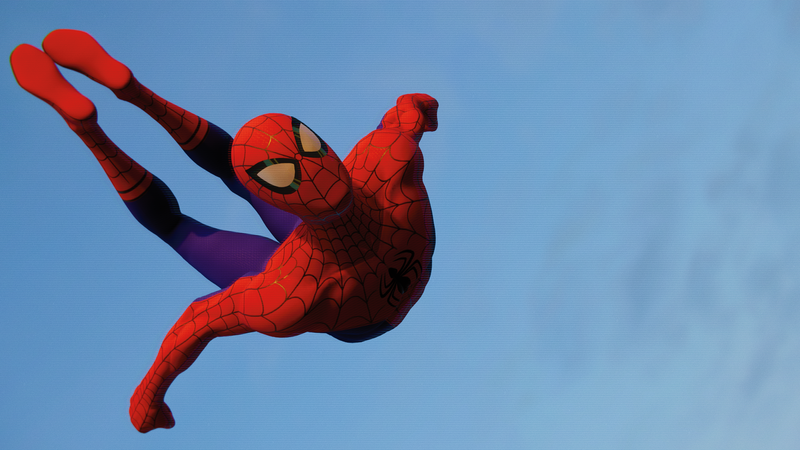 Although you’re still using the same animations that any other suit in the game uses, the aesthetic of Peter’s exaggerated frame, in turn, tricks your brain into making them feel exaggerated. 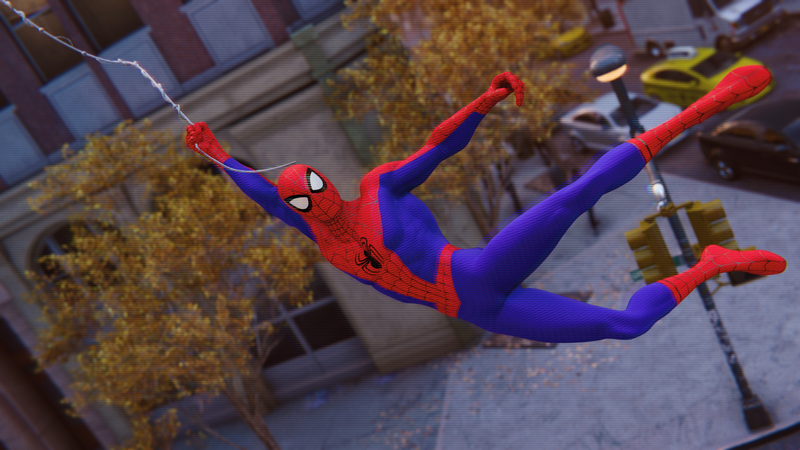 After I unlocked it, I was just enchanted by its style as I took it for a swing around the game’s recreation of Manhattan – he truly looks like an animated character. 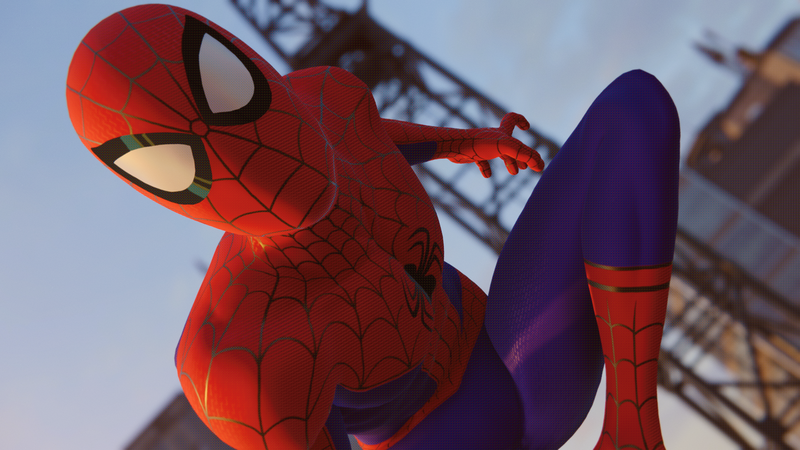 It looks inherently wrong brushed up against the realistically grounded look of the rest of the game, but in a good way – in many ways, it kind of feels similar to how Spider-Ham stands out with his cartoony, Loony Tunes-ian 2D visuals in the 3D CG world of Spider-Verse, that contrast between Something That Should Not Be There and the world around it. 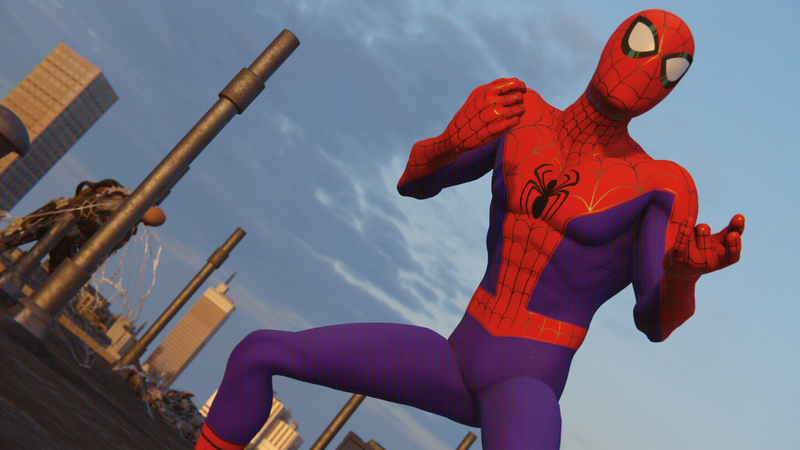 It’s not as obviously in-your-face a subversion of the game’s visual style as the vintage suit or the Mangaverse Spider-Man suit added in “Turf Wars” are at first. But it’s a much more subtle subversion of the game’s look that feels like a lovingly fitting tribute to the inspired visuals of the movie, like a true clash of universes. It’s me. Of course I took plenty of pictures. Pictures of Spider-Man. It brings a little bit of that style, unlike anything we’ve seen from a superhero movie in years, into a whole different multiverse – like a perfect marriage of two of the best bits of Spidey media in 2018. I’m pretty much done with Marvel’s Spider-Man in terms of actually having new content to progress through, but the Spider-Verse suit kept bringing me back over the Christmas period – and likely will for the foreseeable future – just to swing around New York and mess with my brain for a little while. Well, at least until the Spider-Verse Blu-ray comes out, and I can just watch that on a loop.